A Komatsu WA450 front end loader takes a load of logs from Schiller Contracting at the Revelstoke Community Forest Corporation sort yard in Revelstoke, B.C. Watch for a story on Schiller Contracting and the work the company is doing in steep slope logging in southeastern B.C. 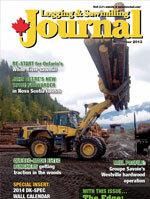 in a future issue of Logging and Sawmilling Journal (Photo by Paul MacDonald). The journey has begun on what the future of the B.C. Cariboo—home to some of the most forest industry-dependent communities in the entire province—could look like in the post-mountain pine beetle era. B.C. logging contractor Ivan Larson—who is past president of the B.C. 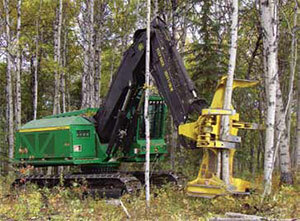 Wildlife Federation—has a special passion for maintaining wildlife habitat as part of the company’s logging operations. Their motto: “creating wildlife habitat since 1929”. Langille Bros. Contracting have had to roll with a series of big time changes in the Nova Scotia forest industry, but they’ve responded to the changes with advanced equipment, including the first John Deere 1910E forwarder in the province. Quebec’s Élément Group is doing some trailblazing, manufacturing a line of feller bunchers in the province—branded under the Eltec name—with a plant in Val-d’Or, and a research and development team in Quebec City. Included in The Edge, Canada’s leading publication on research in the forest industry, are stories from the Canadian Wood Fibre Centre, Alberta Innovates - Bio Solutions, FPInnovations and the Alberta Distance Learning Centre. The Groupe Savoie operation in Nova Scotia focuses closely on details in the woods and in the mill, working with its log suppliers to ensure it receives high quality hardwood timber, and ensuring it gets maximum lumber quality and value in the mill. The re-start of the White River sawmill—through a company headed up by Tembec veteran Frank Dottori—is helping to bring the economy of this small northern Ontario town back to life. Jim Stirling says that when it comes to logging disruptions by First Nations groups, perhaps it’s time to start sending the bill to band councils. Cellulose nanocrystals (CNC) are a high value material that can be extracted from wood fibre. University of Alberta researchers are investigating how adding CNC to polystyrene components of a lightweight composite sandwich structure can produce a stiffer and stronger product, with potential applications in the construction, automotive and aerospace industries. Alberta Innovates Bio Solutions (AI Bio) has provided $240,000 in financial support for the three-year project through its Bioindustrial Research and Innovation program. So far, the research team has developed a way to graft CNC onto polystyrene, resulting in polystyrene composite beads that can then be used to manufacture the structure’s foam core. Furthermore, by applying CNC to reinforce the polystyrene electrospun layer, located between the top and bottom skins and core of the sandwich structure, this will decrease the premature delamination of the top and bottom skins and core layer and will also contribute to the structure’s overall strength and stiffness properties. Dr. Cagri Ayranci, the project’s lead researcher and Assistant Professor at the University of Alberta’s Mechanical Engineering Department, says that the potential dividend for the forest industry in this project is finding valuable applications for CNC in high volumes, thereby creating a new income source for the industry. “At present, we are optimizing the process parameters of producing the beads, but we are very, very happy with progress on the project so far,” says Dr. Ayranci. Supporting him on the project are Dr. Yaman Boluk from the university’s Civil Engineering Department and Dr. Mark McDermott from the university’s Chemistry Department. Both also work with the National Institute for Nanotechnology (NINT) and have been particularly helpful in developing a method to graft CNC on to the polystyrene. Dr. Ayranci says they expect to have fully constructed sandwich structures —featuring the reinforced foam core and electrospun layers—to demonstrate to various industries within a year, and have received considerable interest from a variety of industry sectors concerning the product. They have also had interest shown from some companies that they didn’t expect. Dr. Stan Blade, AI Bio Chief Executive Officer, says this project was chosen for financial support because of its obvious potential. Dr. Ayranci says foam core structures are used in many industries. The idea of using CNC as a reinforcing agent in foam core structures used in the construction industry, such as window frames, came about largely because of the close relationship that the university’s Engineering Department has with the province’s construction industry. Other researchers have previously tried to use clay particles within foams as a reinforcing agent. AI Bio’s sister organization, Alberta Innovates Technology Futures (AITF) has recently commissioned a CNC production facility that can produce about 100 kilograms of CNC per week. 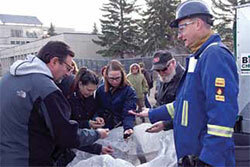 The availability of a local CNC supply caused University of Alberta researchers to think about its potential use as a reinforcing agent. Dr. Ayranci says working with CNC on this project is resulting in a greater understanding of its properties, thus creating the potential for adopting the same procedures for grafting it onto other materials down the road. Further research could also be conducted in potentially using CNC in the production of the top and bottom skins of the sandwich structure. Also, this project is educating highly qualified students and post-doctoral fellows, who will eventually join Canada’s workforce, in the potential uses of CNC. FPInnovations reports on the challenges of implementing scanner scaling in B.C. Forest companies are interested in using laser log scanners for scaling logs as it offers the potential of lowering scaling costs while maintaining an accurate scale. However, a number of regulations and operating practices must be examined and possibly changed before log scanners can be used operationally. FPInnovations has conducted a study on log scaling in British Columbia, with particular emphasis on applying the technology for the coastal forest sector. A federal government body, Measurement Canada, is responsible for certifying that mechanical measurement devices used for trade in Canada meet recognized standards, but no standard currently exists for log scanners to be tested against. Accordingly, the Canadian Standards Association (CSA) Technical Committee on Scaling of Primary Forest Products is currently developing a standard for log scanning devices, and Measurement Canada will ensure that log scanners meet the CSA standard, with the eventual goal of certifying them for trade. The B.C. Ministry of Forests, Lands, and Natural Resource Operations formed a Provincial Log Scanning Technical Review Committee to provide a set of recommendations for implementing scanner scaling to the Director of the Timber Pricing Branch. FPInnovations’ report is intended to provide the committee with background information to help assist its review, analysis, and formulation of recommendations. In the report, FPInnovations recommends that a scanner scaling pilot study be conducted on an accelerated schedule after addressing the issues raised in the report and clarifying the legal requirements for Measurement Canada approval. Such a schedule would likely require that the test be conducted before the scanner receives full Measurement Canada certification. A suggested pilot study outline is included in the report. For more details about the report, contact Peter Dyson at peter.dyson@fpinnovations.ca or at 604-222-5635. 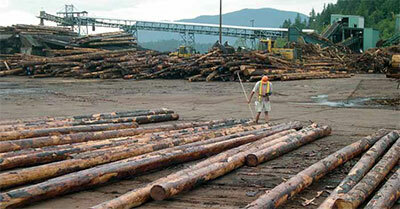 In the forest products industry, competition is driven by fibre costs. Delivered wood fibre typically represents between 50 to 60 per cent of production costs at most Canadian softwood sawmills, and between 25 to 40 per cent at pulp and paper mills. Any improvement in the highly capital intensive forest-to-mill value chain is bound to increase the competitiveness of traditional industries while supporting the emerging bioeconomy. The starting point for any improvement towards more efficient and productive forest operations is the gathering of relevant and accurate data concerning equipment performance and productivity. After all, you can only improve what you can measure. For logging contractors and equipment operators, the most important challenge is to measure and integrate several parameters at once: productivity information to know real costs; downtime data to improve operations management, reduce operating costs, and implement preventative maintenance strategies; accurate production/performance feedback to forecast future performance and improve budgeting; and accurate inventory management and workflow information to manage cash flow and work schedules. Currently, there are more than 5,000 pieces of logging equipment operating in Canada, which harvest an annual volume of 120 million cubic metres from the country’s forests, providing more than 30,000 jobs. This sector could benefit from a minimum of $50 million in increased profitability by using optimized solutions. Over the past several years, FPInnovations researchers from the Forest Operations program have taken great care in designing and building FPDat, an on-board computer that collects and analyzes data directly from heavy machinery. A rugged device built to withstand difficult conditions such as forest, mining and construction operations, FPDat informs operators and managers on various parameters such as utilization, treated areas, GPS track logs, productivity and the causes of downtime. FPDat is actually the core of FPSuite, a seamless operation monitoring system that aims to reduce harvesting and transportation costs. FPSuite also includes FPCom, the data communication modules, and FPTrak, the web-based data hosting and reporting tool. Data collected by FPDat is transferred to an office via one of the many FPCom technologies, then managed and accessed by users on the FPTrak web portal. FPDat and the other tools of FPSuite were developed with the financial support of the Transformative Technologies Program (TTP) of the federal government. More than 300 FPDat units are already in use all across Canada and as more specialized modules are being developed, such as the Transport and the Grader modules, more users are getting in line for their share. FPDat is equipped with a touch screen that displays real-time performance indicators. This allows operators to enter important information such as ID and ongoing activities, as well as to instantly quantify the impact of any decision on performance and therefore on profitability. A motion sensor continuously gathers the necessary data required for calculating the equipment’s level of use in real time. Production downtime can be signalled by the operator using FPDat’s touch screen, allowing the constant review of work procedures and methods in order to increase operational time. FPDat’s integrated navigation system enables it to determine and display the spatial location of any machine in which it is installed. Customized operating maps can be uploaded and displayed on the screen, as well as the machine’s position in real time in relation to boundaries and other constraints. FPDat’s mapping interface supports ESRI format as well as geo-referenced images, and can display overlays showing personalized performance indicators. FPDat also accepts personalized production parameters. As a result, operators can save information on the work achieved, depending on the type of operation performed. For instance, a forwarder operator can easily enter the quantity and type of product that was unloaded at roadside, making it possible to estimate and locate the total volume transported for each product. 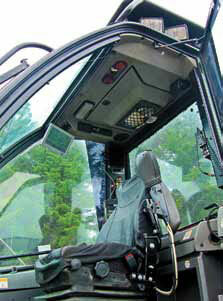 At the end of the day, revenues depend on whether or not the equipment is used to full capacity. FPDat provides this valuable information in real time. The analysis of working hours compared with non-productive hours makes it possible to increase the use of equipment and, consequently, income. Having clear productivity objectives and real-time results is a source of motivation and success for personnel. As an integral component of a continuous improvement process, FPDat is a tool to help employees work towards successfully reducing costs. 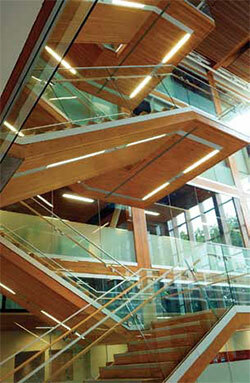 FPInnovations is set to release a technical guide for the design and construction of tall wood buildings in Canada. The purpose of the technical guide is to support the design and construction of tall wood buildings and facilitate acceptance by authorities having jurisdiction using the alternative solutions path in building codes. Under the guidance of a working group comprising design consultants and experts from FPInnovations, Natural Resources Canada (NRCan), and the Canadian Wood Council (CWC), more than 60 technical professionals—architects, structural engineers, code consultants, experts from universities, FPInnovations, National Research Council and the CWC—have been involved in the development of this guide. Tall wood buildings currently fall outside the scope of acceptable solutions in North American building codes and design manuals for wood structures. Design teams of tall wooden buildings will have very specific design, con struction, and maintenance challenges that will need to be addressed, and those responsible for the first demonstration buildings will have additional considerations. This technical guide is designed to systematically address those challenges in selected demonstration project(s). Intended to assist architects, engineers, code consultants, developers and building owners, the guide is not specific to any one structural solution. Rather, it establishes the parameters and resources necessary for a capable team to design a tall wood building that meets the performance requirements of current building codes and the competitive building marketplace. It’s expected that owners, design teams, and authorities will expand on the guide with the specifics appropriate to their projects and that future editions of the guide will add increasing detail as the industry grows and the more efficient systems are developed. Tall wood buildings have existed for centuries—tall wooden pagodas up to 19 storeys high were built in Japan some 1,400 years ago, and are still standing today in high seismic and wet climate environments. In Canada, in addition to many five to six-storey light wood frame buildings, some notable mass timber buildings have been or are being constructed, such as the five to nine-storey heavy timber buildings in Toronto and Vancouver, as well as the University of British Columbia’s five-storey Earth Sciences Building in Vancouver, B.C. For more information, contact Erol Karacabeyli at erol.karacabeyli@fpinnovations.ca or at 604-222-5645. Canadian Wood Fibre Centre (CWFC) staff at the Northern Forestry Centre in Edmonton rolled out the red carpet for their colleagues at the Canadian Forest Service (CFS) in late October with a Field Day aimed at encouraging more “cross pollination” between the two groups on developing innovative biomass production and conversion systems. Derek Sidders, CWFC Program Manager and Regional Coordinator for the Prairies, says the organization is eager to partner with researchers from the CFS and other organizations because it diversifies and enhances the scope of their research programs and maximizes the benefits to their stakeholders. CWFC demonstrated just one example of an innovative biomass conversion option at the Field Day with onsite production of biochar from wood fibre, using a mobile pyrolysis unit it accessed through another one of its partners, Alberta Innovates Technology Futures (AITF). 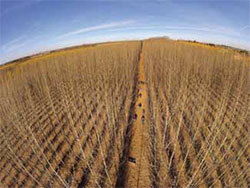 The two organizations are working together on the Alberta Biochar Initiative. The Field Day also featured a tour of CWFC’s first concentrated biomass and high yield afforestation research site south of Edmonton, as well as an introduction to the innovative digital imaging tools CWFC and CFS staff have combined with remote control, unmanned aerial vehicles to gather visual information that can be used to develop virtual field tours of its research sites. Tim Keddy, Wood Fibre Development Specialist with CWFC, said that the organization has made significant strides over the past two decades establishing and demonstrating management and harvesting regimes for concentrated woody biomass, as well as fibre grown through high yield afforestation. He added that CWFC has successfully established a national network of short rotation, wood crop, technical development research sites. Sidders pointed out that these sites are available to CFS scientists and researchers for their own research programs. As part of the Field Day, CFS researcher Dr. Jagtar Bhatti provided an example of how he has set up instruments on CWFC plantation sites north of Edmonton, and in Manitoba and Ontario, related to measuring the plantation’s potential to function as a carbon sink over its growth cycle. 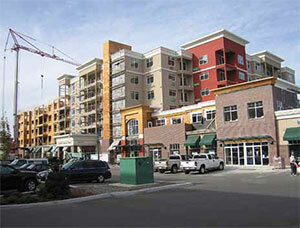 This work has been completed in partnership with the University of British Columbia. Among the 25 individuals taking part in the Field Day was Northern Forestry Centre Acting Director General, Ken Mallett. He added that like the CWFC, the CFS is also interested in bio-energy and how that industry can be expanded in future, noting that there are obvious opportunities for collaboration with CWFC in this research area, given the number of hybrid poplar test sites it has developed which demonstrate different clones and management regimes for developing wood fibre as fuel for bio-energy production. Mallett said that CWFC’s tests sites will also prove invaluable for the CFS’s Carbon Group, which works on a carbon model for Canada. CWFC’s unmanned aerial vehicle technology could also help to play a role in this area not only for its video capturing capability, but also the vehicles’ ability to carry measuring and monitoring devices above the forest canopy. Finally, he said that CWFC’s work with AITF on the Alberta Biochar Initiative could mesh well with the work that CFS is doing to investigate ways to reclaim and—possibly accelerate—growth of forest stands impacted by oil and gas industry activities. Alberta high school students are now becoming better informed about various career opportunities in forest management and operations through credit courses delivered by Alberta Distance Learning Centre (ADLC). With the assistance of resource support and forestry equipment provided by the Woodlands Operations Learning Foundation (WOLF), ADLC is reaching high school students, with the intent of attracting more students to occupations that have some measure of forest management in their job descriptions. ADLC has been offering learning opportunities to meet the diverse and evolving needs of Alberta’s students and the work place since 1923. As part of its commitment to provide innovative education at a distance, ADLC is now offering five, one-credit Career and Technology Studies (CTS) courses that can be completed online. The five online courses are Forests and Society, Forest Ecology in Regions of Canada, Forest Use and Protection, Forest Protection and Stewardship, and Forest Research and Development. They span the 10, 20 and 30 level. After completing the five courses, schools can apply for project work that involves a minimum of six hours of training on forest harvesting simulators with guidance from a qualified and experienced instructor, as well as discussion on careers in forestry. After a pilot project involving five Alberta high schools last year, interest in the program has continued to grow. This year, Forestry is being offered in nine high schools across the province. According to ADLC lead instructor Jacalyn Watson, every school that participated in the pilot project wants the program back, and five other schools are presently on a waiting list. With students as far north as Fort Vermillion and as far south as Nobleford having taken the courses and simulator project, Watson says it was gratifying to offer the experience to students in areas where forestry is not well known or considered often as a career option. “It was wonderful to see students that have never thought of forestry before suddenly say, ‘wow, I never thought of this’,” says Watson, particularly after they have had an opportunity to work with the harvesting simulators. At those times, she adds that ADLC tries to take that interest further and help students investigate actual career paths with industry. Watson says that she has no doubt that students who have participated in the program have followed career paths into some aspect of forest management based on the responses she has heard from students so far. Based on those positive responses, ADLC is in the process of developing a high school credited project module with resource assistance from WOLF aimed specifically at careers in forestry and the pathways to get there. WOLF Executive Director David Blackmore says partnering with ADLC on program development and delivery was an attractive opportunity, given the Centre’s experience working with the Alberta education system delivering credit courses to high school students, many of them online. “There’s no question that the interest is there, and people want to take the courses,” says Blackmore. WOLF provides educational services for operational workers through to professionals from the public, forest, petroleum and utilities sectors working, playing or just living on forested land. “WOLF’s mission is to provide professional quality learning opportunities for people with a footprint on the forest land. These services are also available to pre-employment educators,” says Blackmore.